How many people do you know right now that are sick? Whether it is the cold or flu, the likelihood is that they what made them sick are germs they picked up from somewhere else. A cold doesn’t just spontaneously appear out of thin air. 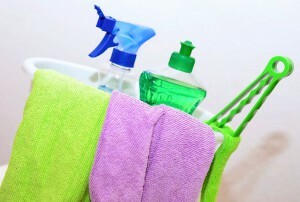 This is the time of year that you have to be extra diligent with keeping your home germ free. Here are some good ideas on how to get that done. Just think about all the surfaces you touch when you leave the house? A grocery-shopping cart, door handles and shaking hands. That’s a lot of germ potential. The moment you come home, you should wash your hands before you touch anything. That rule should apply to your entire family, especially the kids coming home from school. Having germs on your hands become a problem when you rub your eyes or use your fingers to eat. That’s why they need to stay clean. Not every day has to be spring cleaning day during cold and flu season. A good approach is to do light cleaning. This should happen after you’ve done the thorough cleaning. The light cleaning is the dusting, moping and sweeping that keeps dirt and grime from piling up. Wiping down bathroom and kitchen fixtures is also a good daily habit to get into. Your ceiling fans and curtains are magnets for dust. The reason is that they are rarely cleaned. Make the investment in a duster that can reach the ceiling fan. As for the curtains, vacuum them once a week as you are vacuuming your rugs. Put those special attachments to work. The moment you get over a cold, you’ll want to swap out your toothbrush. You should be regularly changing it every three months. The toothbrush is also best stored inside the medicine cabinet and covered. Reduce the risk of brushing with germs. Anything in your home that is considered clutter should be removed for good. The reason it is clutter is because you’re not using it. That means you’re not cleaning it. This holds true for sofas and recliners down in the basement as much as clothes in your closet. The more clutter you remove from your home, the less chance dust and germs have a hiding space. To get this done, you only need to call in Junk Works. They’ll send over a clearing crew that will swiftly go through your entire home pulling out all the things you are no longer using. Put Junk Works on your junk clearing task today and keep your home germ free. This entry was posted in Cleaning Tips, Junk Removal and tagged clean, germ, junk works on January 31, 2018 by Junk King. Last updated February 2, 2018 .